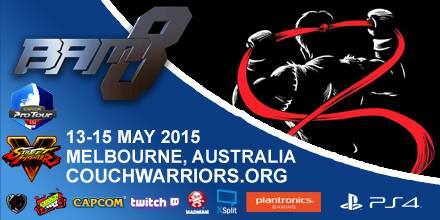 This past weekend CouchWarriors’ Battle Arena Melbourne (BAM10) reached its 10th Anniversary. ANZ’s largest open entry esports event, held May 18-20 at Melbourne Convention Centre, once again broke records with over 2,000 attendees. It was also the debut of a major partnership with Twitch TV to reward ANZ players and grow the fighting game esports scene. Announced during BAM10, this will provide flights and accommodation for 3 players who reach the highest placement among Australian or New Zealand players at BAM. Also announced is an ongoing tournament points system which will lead to next year’s BAM11, in which players will once again have the opportunity to prove themselves and win a trip to EVO 2019. The biggest tournament event in ANZ fighting game history, BAM10 grew again with over 2,000 attendees and over $40,000 in cash and prizes. The gaming convention and esports event featured global pro tour stops for Tekken World Tour as a Master Event, and Capcom Pro Tour as a Ranking Event. This alongside a huge lineup of national tournaments and convention activities including access to preview games, indiecade, Nintendo Game zone, PC LAN, Artist Alley and Cosplay. More detailed full results, further photography and video replays from BAM10 will be released in the coming days.